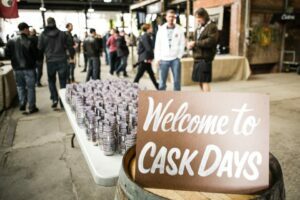 Cask Days has become an annual event for Paul and I. I do love a good beer, and there is always something interesting at this event. This year was no exception! As usual, my focus was more on the cider. 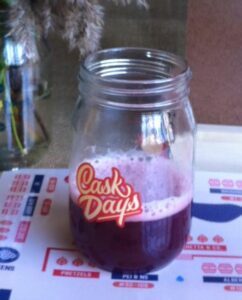 I was disappointed that Shiny Apple weren’t back at Cask Days; they were a favourite of mine last year. But West Avenue were there with a delicious Wild Pear cider, and another of last year’s favourites – the Bourbon Barrel Aged cider. Sadly, though, I think someone forgot to take the bourbon out of the barrel for this cask. The flavour was very much “BOURBON! AND WOOD!!! Oh, andatinylittlebitofciderinthefinish…”. Deeply disappointing. The Spirit Tree “Tokyo Snakebite” was far more successful – cider with ginger and wasabi. Very nice, with a bit of heat growing on the finish from the ginger and the wasabi. It would be terrific with sushi. Niagara Oast House brought a delicious fruity take on a gose, with lychee (Dr. Lychee Gose Nuts). Amazing! Light, fresh, just a little sweetness from the lychee to balance the salt of the brine; I really enjoyed this one. Cameron’s Augen Auf Pretzel Gose w. Coriander had me intrigued, and I was really excited about it. The first sip was “hm. okaayyy….” and the second sip was “Don’t do that again”. Soapy and thin and not at all good. I had two others (Dieu Du Ciel! Tamarindo Gose, Revel Cider Co. Maple Apfelgose) which just weren’t noteworthy. Really missed the Trois Mousqetaires Gose that I had last year (and have since bought a case of…). If you see it, grab it. It’s a great example of a gose; fresh, a little salty, with a delicious minerality and lime zest note on the finish. A favourite of mine… and Paul’s… and Andy’s… and Steve’s…. was the lovely pink concoction you see above! Hard Drive Problems comes to us from Monkish brewery, in California. It’s a bright, tangy Strawberry Ale, with a bit of sourness – in a really good way. I loved the name; loved the beer. This would make a great palate refresher during a big meal, or a great summer patio beer. You could make a tasty punch with this; the cocktail potential is endless, too. Altogether, a fun day. I tried a lot of things that weren’t for me, and a few things that I will now go buy. For an event like Cask Days, that’s a great success! Can’t wait for the next one….